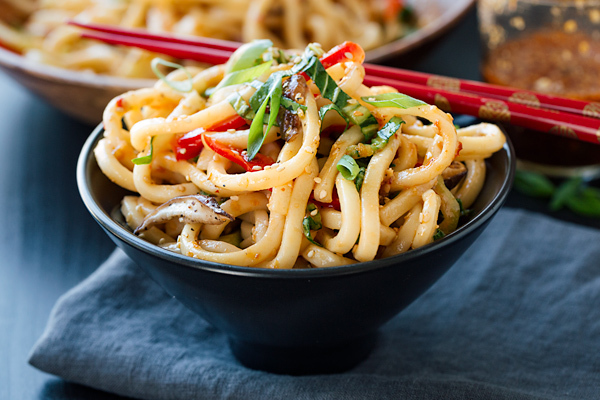 Chilled udon noodles tossed lightly with a flavorful garlic-sesame dressing, crisp baby bok choy, earthy sauteed shiitake mushrooms, and slices of red pepper make for an easy-to-prepare healthy and light meal; it’s a perfect recipe for the warmer seasons, deliciously savory and satisfying. What Goes with Udon Noodles? 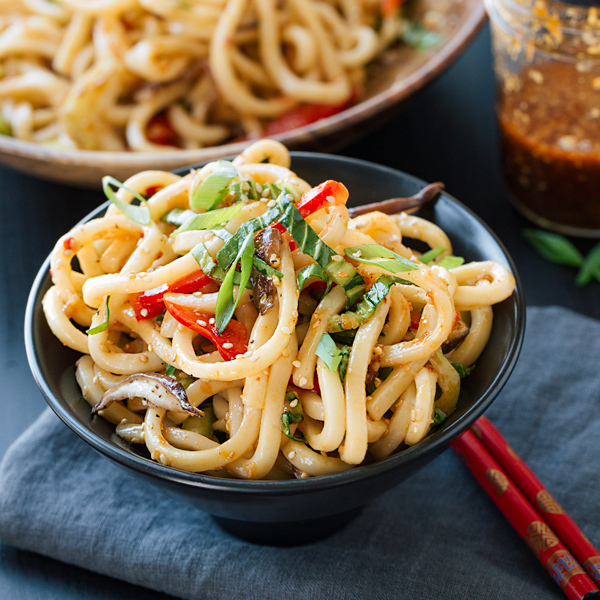 Udon noodles are those delicious and slightly chewy Japanese wheat noodles that are often used in both hot and cold dishes in that cuisine. They’re succulent and slurp-able served hot, light and refreshing served cold. They’re perfect in soups and in boldly flavored stir-frys; and just as delicious served as a “noodle salad”, and dressed in a sweet-savory and mildly tangy sauce. Both hot and cold, udon noodles offer a variety of ways to prepare, all pleasurable for the palette. Dried and fresh udon noodles are available, and it just depends on your taste and your preference when it comes to the cooking process. 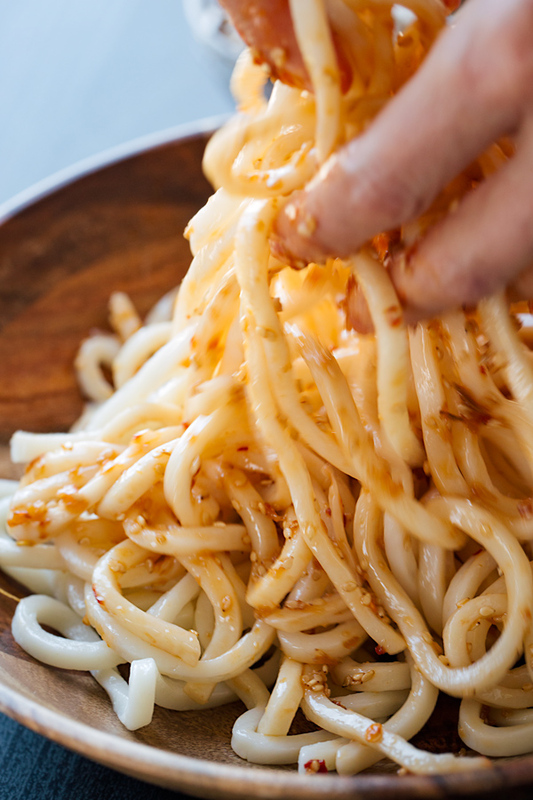 If you don’t mind a bit more of a challenge, dried udon noodles are perfectly fine to use; but frankly, they can become a little gummy and starchy if not finessed during their boil, and they’re not quite as thick and chewy as the fresh ones. The fresh udon noodles are very easy to cook, taking only 2-3 minutes in boiling water; and with fresh, you don’t get the starchy-ness (love that). What you do get is a nice thick noodle, a great bite and a fantastic chew, which is truly satisfying. So the fresh are always my preferred choice. Once cooked and rinsed in cool water, they’re ready to be dressed in a delicious sauce full of garlic, sesame, soy, ginger, some honey and a few other ingredients—those savory flavors that hit all the right notes. 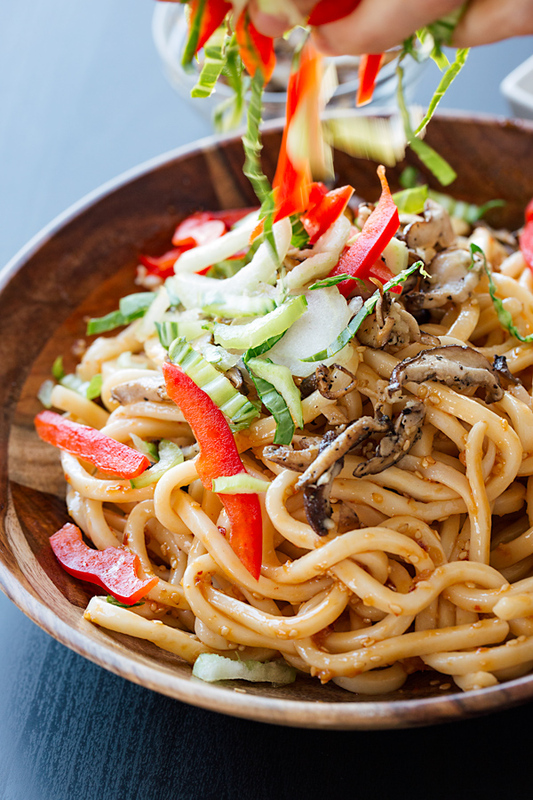 And when paired with healthy and vibrant green baby bok choy, some quickly sauteed, earthy shiitake mushrooms and thinly sliced sweet red bell pepper, it’s a colorful and veggie-ful chilled noodle dish sure to delight. • Where to find fresh udon: Typically fresh udon noodles come vacuum-sealed, often in those soup packages, in either the refrigerated section of your local grocery store or Asian market. 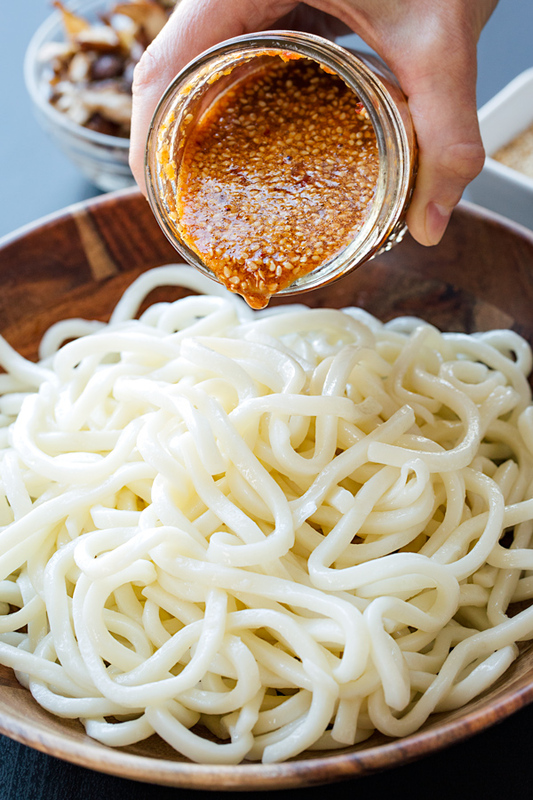 You really only want the udon noodles, not the soup seasoning, so you can discard that. Drain and rinse immediately in cold water, and you’re ready to dress. • Cool your mushrooms before adding them in: After sautéing your shiitake mushrooms, allow them to cool before adding them into your chilled noodles—you don’t want to warm things up. • Make ahead and chill: You can prepare the ingredients and dressing for this recipe ahead of time. Just cook the noodles, drain and rinse under cold water and place into your fridge. You can also prepare the dressing and slice the veggies, just make sure to keep those cold too. 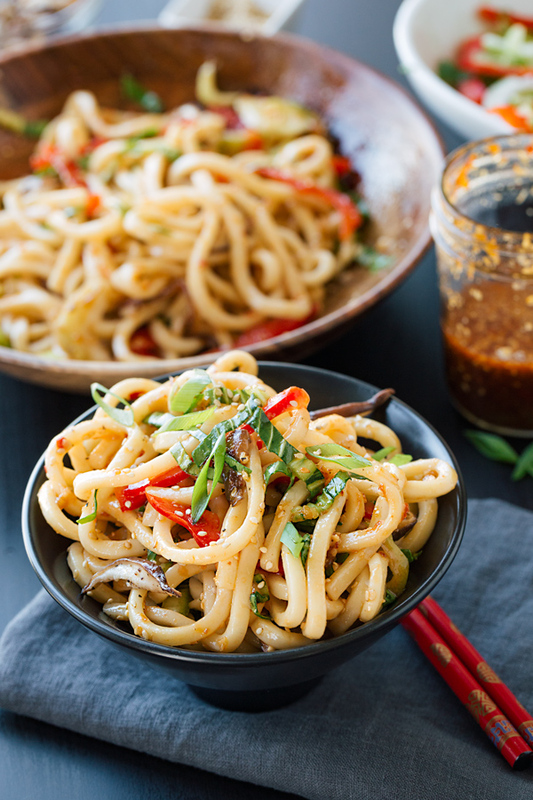 Dress the noodles once you’re ready to serve for freshest flavor (though leftovers can be refrigerated and enjoyed for a couple days after). • Where to find the “chili” elements: Chili oil and chili garlic sauce can be found in the Asian foods section of your local market, typically. The chili-garlic sauce is an already-prepared ingredient, and comes in a little container/bottle with a green top. -Place a medium-large pot of water over high heat, add in a few pinches of salt, and bring to a rapid boil; once boiling, add in the fresh udon noodles, and using chopsticks or the handle of your spoon, gently move them around to separate them, and cook for no longer than 3 minutes; drain and rinse under cold water thoroughly until the noodles are chilled. -Place a large pan over high heat, and drizzle in a bit of the oil; once hot, add in the sliced mushrooms, along with a pinch of salt and pepper, and saute for a few minutes until softened and golden-brown; then, add in the garlic and stir to combine, sauteing just until aromatic; spoon onto a plate to cool for a few moments. 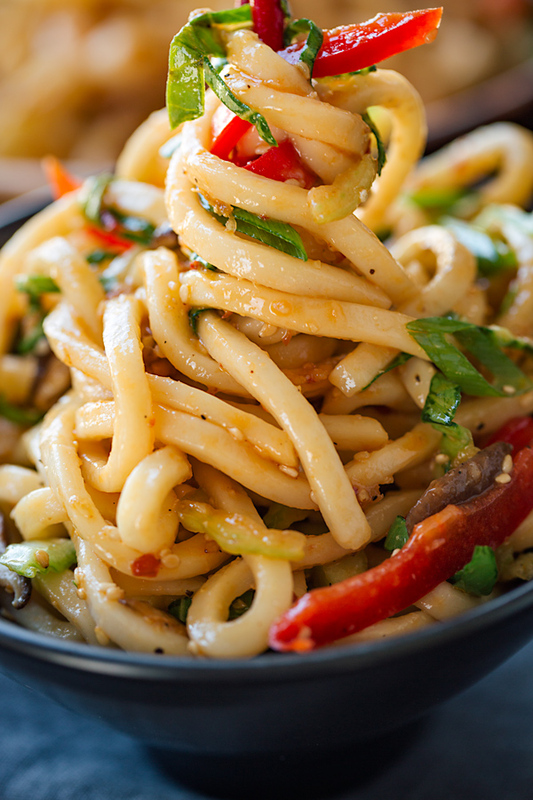 -Add the chilled noodles to a large bowl, and toss with the dressing; then, add in the sliced baby bok choy, red bell pepper, and cooled sautéed mushrooms. Toss gently to combine. -Divide evenly among bowls, and garnish the tops with some green onions and a sprinkle of sesame seeds; serve cold. -Add all ingredients to a jar with a top that you can close (a mason jar is perfect for this), and shake the dressing very well to completely combine all ingredients; use immediately, or keep cold in fridge. I don’t think about how much I truly dislike being sick until a bit of sickness hits me. Typically, I only occasionally get a bug of some sort, but last month, I found myself with a head-cold type thing not once, but twice. I was hoping beyond hope that this year I would escape unscathed when it came to the different seasonal maladies that seem to circulate. But alas, all of the vitamins that I take like a good girl, and all the exercise I try to get wasn’t quite enough somehow to stave off a couple of viruses that came in on the coat tails of some stress (which always seems to leave me vulnerable to little bug-a-boos)—I got the good old “two-for-one” deal just weeks apart. For me, a head cold always means the temporary loss of my sense of smell and taste due to swollen sinuses, and that’s particularly rough on me. It’s an interesting thing to feel hunger and to prepare something, and then to sit down and eat without any pleasure because there is no taste involved, no color nor vibrancy in what is being chewed and swallowed. At that point, it is only a matter of filling the belly. I realized that the act of eating in such a state was actually a bit frustrating because there was zero pleasure from the flavor, and that is where all of the enjoyment in eating is found. Of course food provides sustenance and nutrition, without which we would not survive; but it is the flavor in food which gives depth and meaning to the act of eating; and in that moment when I could not taste (and therefore found no real pleasure in my experience), the act seemed so very bare and even quite sad. The emptiness I felt from my lack of taste made me not want to even eat, and I couldn’t help but think in that moment how obviously important my sense of taste/smell is to me, not only when I sit down to eat a meal, but for what I do for a living (cooking) in my day to day life. It so very much contributes to my self-expression, to the wholeness of who I am. And so it is true for many areas of life where “taste” is important. It’s funny how such a little thing, a thing that I all-too-often take for granted I’m ashamed to say, makes such a big difference in all that is pursued in life. For any endeavor worth pursuing, there must be at least a degree of flavor to be experienced which will entice one to continue on, beckoning one to open their mouth for the next bite of what’s to come. 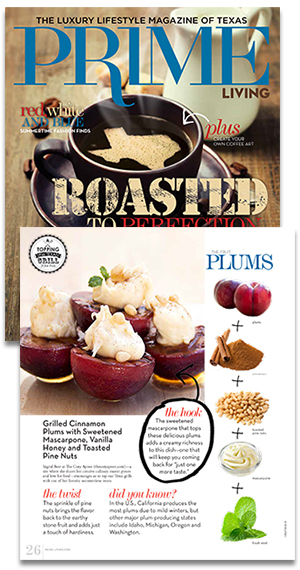 Tasting and experiencing flavor is what we’re all about, what anything we do is all about. It is in the flavor of something that we find reason to go on. We find our “forward pull” in it. We long to return to something and to see it through when we find much to taste in it, as it is then that our juices flow and our desires open up, and we need that. Getting my sense of taste back was a wonderful and exciting thing when it happened. And I am grateful to have had that experience illuminate that for me, and to give me an opportunity to reflect and not take lightly the fact that flavor is needed in all areas in life. Without flavor, we experience only a frustrating blandness—only empty acts—rather than the feeling of fulfillment and genuine satisfaction, which is what we truly (and ultimately) long for. My hope is that I taste good flavor in all that I do; and if I do experience an occasional loss of taste, may it only be temporary. Made this for dinner tonight and I can’t wait to eat the leftovers for lunch tomorrow! Great great recipe! Thank you! 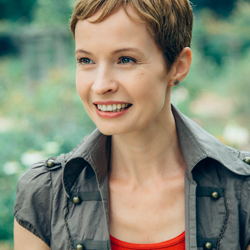 Hi Carolyn, so glad you did! Hope you enjoy this for lunch tomorrow, and thank you for sharing your experience! Hi, I don’t see any instructions for the mushroooms. Do you sauté the 6 garlic cloves with the mushrooms? Really looking forward to trying this! Whoops! Oh my goodness, Kim- thanks for bringing that omission to my attention. Got it fixed and updated now! Hope you enjoy! I love udon noodles, but I’ve never actually cooked with them. This recipe looks so simple yet delicious. Thanks for sharing! Hi Karyl, thank you! Hope you try. Chilled garlic sesame udon noodles were a hit. Made sauce as described. However, simply tossed following vegetables with noodles and sauce: red pepper, green onion, cilantro, English cucumber. Great heat with refreshing coolness. Will definitely make again! Hi Christine, so happy to read that! This is a perfect warm weather salad, really refreshing and simple; so I’m glad you made it to fit your tastes! Thank you for sharing. I don’t know how I came to this recipe, but I’m so happy I did! Made these two nights ago and am enjoying the last of the leftovers now. It’s such a great base recipe. I sauteed the bell pepper along with the mushrooms, as I don’t like them raw. I also added some tofu, but next time, I think I’ll saute some prawns in garlic and oil to add in. Shredded carrot would be nice too, I think. Thanks so much for this recipe! Hey, wonderful! So happy to read that you enjoyed it, and those little tweaks for next time sound absolutely perfect. Thanks for sharing!